Put these chic white café chairs in your café, your coffee house, your European bakery, our Thonet style dining chairs are the trend of the minute but lasting popular designs. The Relax House Café chair is carefully constructed from Beech wood and is pictured here in white, the perfect bight colour for your kitchen, café, restaurant or dining area. Put these beech wood dining chairs in your home kitchen or dining area for an affordable designer touch. These white café chairs are the perfect addition to the all-white kitchen or bright happy sunroom or breakfast nook. 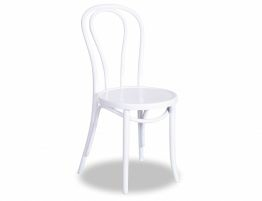 Because these café chairs are so classic and even more so in the white colour, you will likely have them for a lifetime. 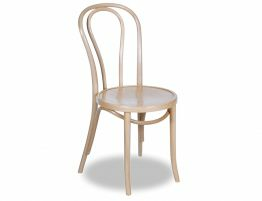 Our bentwood dining chairs have been made in the same way and in the same Polish factory that has bent wood for Thonet chairs for well over a century. Did you notice the beautiful sunburst pattern that is subtley embossed on the seat of our Michael Thonet designed original? 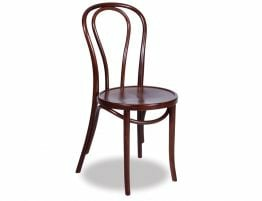 This wood restaurant chair or home dining chair is a collection of curves and slender legs but this is a commercial dining chair that is built to stand up t heavy use. A chpice of European cafes, our bentwood original Thonet designed classic is at home in your house or commercial dining setting. These chic and simple chairs can be yours without scouring the antique shops or refurbishing old chairs. 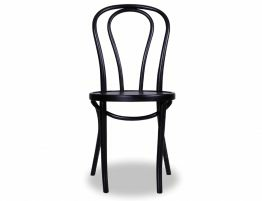 The well known Michael Thonet designed No.18 chair has been a favorite of furniture followers since 1876! Michael Thonet, the designer of the lauded Vienna Café chair, was a German cabinet maker and an iconoclast of sorts when it came to furniture. One of the first pieces of mass produced furniture, the No.18 café chair is a fixture of bentwood design history. 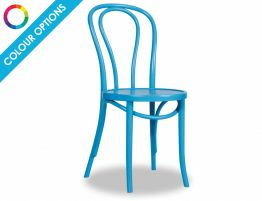 Whether you favour a modern esthetic or a polished French country look, these iconic café chairs elevate your design. Our authentic Michael Thonet designer chairs are made in the very same factory in Poland that has made Thonet chairs for over a century. Our original Michael Thonet designed No.18 Vienna Cafe chair carefully attends to the details that have made this restaurant chair such a unwaveringly popular furniture design.